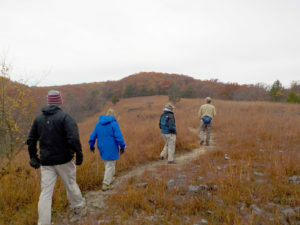 CAS members hike the Rocky Top Trail at Lake of Ozarks State Park. On a freezing Saturday morning, five members of CAS met at the AC parking lot to carpool to Lake of the Ozarks State Park. The original plan to hike Bluestem Knoll morphed into a hike on Rocky Top Trail as it provided more cover from the wind than the savanna of Bluestem Knoll. It was a gloomy morning, and even though we arrived at the trailhead around 9:30 am, the birds remained pretty quiet. Fall color was in peak on the hike across the large dolomite glade and through the dry white oak-dominated woodlands. 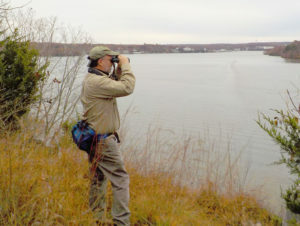 Despite the cold, wind, and cloud cover, we tallied 27 species of birds with Eric Wood keeping track. The windy conditions likely impacted the chances to see the wide diversity of sparrows that normally inhabit the glade. CAS member John Besser scans the horizon at Lake of the Ozarks State Park. Nevertheless, we were greeted with the rambling chirps of two Carolina wrens in the creek as we left the glade and hiked into the woodlands. Managed with fire for over 25 years and slated to burn in this fire season, the Rocky Top Management Unit is a hotspot for open woodland-loving birds. Summer brings many pairs of breeding summer tanagers and red-headed woodpeckers, and on our fall field trip, we picked up a lot of Carolina chickadees and tufted titmice in the woods. Along the shoreline of Lake of the Ozarks, 17 white pelicans glided in for a landing in the protected cove. In the concrete riprap of the shore, our group had a great view of a winter wren who hopped energetically from shrub to rocky hole, and then back up again. After the field trip, we caravanned to Shawnee Bluff Winery for a leisurely lunch at the wine tasting bar and arrived back in Columbia by mid-afternoon.